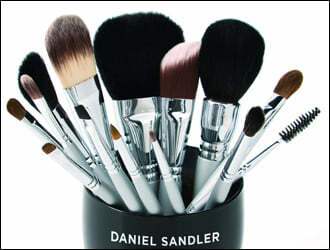 Be your own makeup artist with a full complement of Daniel Sandler makeup brushes. From everyday looks to bridal makeup, these hard-working tools are the perfect accompaniment to your beauty routine. Give your makeup bag a makeover and fill it with a range of high quality, professional brushes made from Taklon, natural hair, and synthetic hair. Each makeup brush has densely packed bristles to ensure the perfect distribution of your Daniel Sandler beauty products.